Does what’s included make a difference in your river cruise considerations? If so, you’ll appreciate a new downloadable PDF that we’ve produced, available to you, as is everything on this site, at no charge. The chart provides a quick and easy way to glance at what the top river cruise companies include in their cruise fares. Scenic appears to lead the pack with green checks across nearly all categories in our chart. That comes as no surprise to us. Not long ago I spoke with Scenic’s founder, Glen Moroney, who expressed his company’s aspiration to be the most-inclusive of all river cruise lines. To make its mark this year, Scenic added laundry to its list of inclusions. Tauck and Uniworld include much of what Scenic offers – but some inclusions, such as room service, are for certain stateroom categories only. CroisiEurope goes all-inclusive in 2016 but lacks some of the features that Scenic, Tauck and Uniworld boast, such as bicycles, minibars and exclusive events. Instead of aspiring to be the most inclusive, however, CroisiEurope hangs its hat on being the price-leader in European river cruising. A-ROSA offers quite a lot, and though the company initially offered shore excursions in its roster of inclusions, the line now ponies up a €200 per person shipboard credit that can be used against the cost of shore excursions, spa credits and other shipboard purchases. An A-ROSA spokesperson told us that the credit allows guests the freedom to choose the experiences they want instead of being locked into doing shore excursions. AmaWaterways, Avalon, Emerald and Viking are solid players offering lots of inclusions but stopping short of offering unlimited beverages and all shore excursions. While all of these companies offer at least one complimentary shore excursion in each port of call, they charge for optional shore excursions. And while wine and beer are served freely at lunch and dinner, these lines charge for drinks outside the dining hours. Inclusions lack relevance, however, unless pitted against price, and we have charts for that aspect of river cruising too. Check out our Price Comparisons for cruises on the Douro, Seine, Rhine, Danube, and for cruises Between Amsterdam & Budapest. Our best advice for getting the best value? Find a good travel agent and put him or her to work for you. 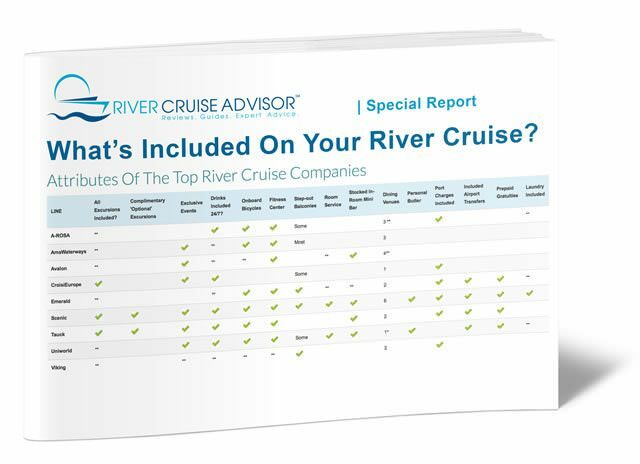 Download our free PDF Attributes of the Top River Cruise companies.